Car hire at the airport. About a 30 minute drive to the hotel where there is ample parking. Situated just a short bicycle ride from one of Mallorca´s prized beaches Es Trenc, the Font Santa Hotel Thermal Spa & Wellness really is a oasis with many treats in store. 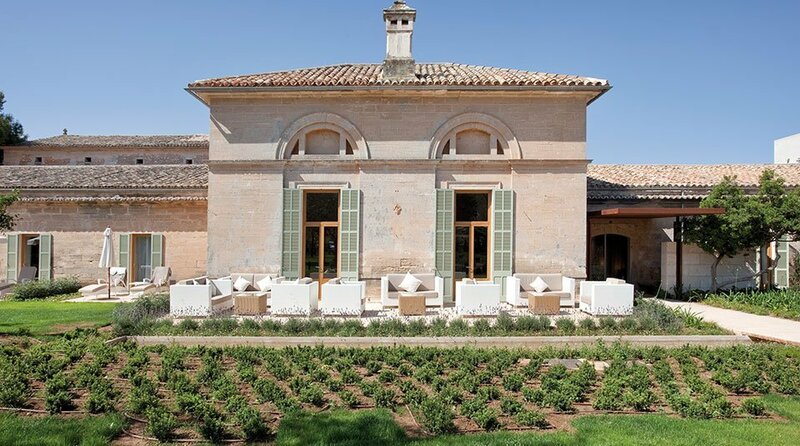 As the huge gate slides open, you are greeted by a vista of sweeping manicured lawns, lavender-lined flowerbeds, bucket-style wicker seating, the glistening waters of the two swimming pools and the shaded awnings of the jacuzzis. It really is a glamorous 5 Star Hotel. The warm hue of the pristine sandstone buildings conceal their history. Font Santa Hotel & Thermal Spa & Wellness offers the only thermal spring in the Balearics, Sant Joan de la Font Santa. The Romans were bathing here two thousand years ago and people came here to take the waters right throughout the Middle Ages. Then in 1869 the waters were officially approved for public use because of their health giving properties. The Oliver family, who are still the owners today, have for generations worked tirelessly to maintain and upgrade this unique heritage property. All 36 bedrooms, which vary in size and are spread over several buildings, offer a neutral colour palette with artworks and all have a juliette balcony, full balcony or private terrace with views over the natural landscape of the salt flats of Es Salobrar de Campos. Last year there was an additional of a luxury two bedroom villa set in the grounds of the hotel just metres from the main house. 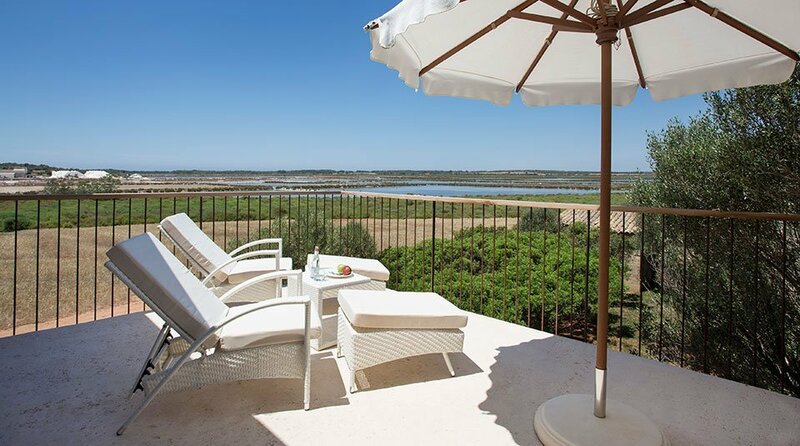 Set over two floors overlooking Es Trenc Natural Park, the views are amazing. Outside you have your own private terrace with swimming pool, garden and private parking. Font Sant Hotel & Thermal Spa you can relax both inside and out, in a tranquil setting and discover the secret healing properties of these thermal waters. The Staff at Font Santa Hotel Thermal Spa & Wellness are warm and welcoming, have a look at the TripAdvisor reviews yourself Font Santa reviews. Time to let your soul catch up with your body at Font Santa Hotel. Without doubt the thermal spa waters. This is a spa in the truest sense of the word but with all the benefits of today´s luxuries. The actual source of the waters remain a mystery, emerging at a temperatures around 38 degrees, which have been heated thousands of metres below the earth before rising up to the surface bringing with it high levels of minerals predominantly chlorine, sodium, magnesium, calcium, and potassium each giving restorative and healing properties. These mineral rich waters stimulate a series of positive effects on the body such as skin repair, blood and lymphatic circulation. The spa at the hotel has its own separate reception, houses a large thermal pool, a jacuzzi, steam room, ten individual thermal baths, hand and foot baths, three treatment rooms, a physiotherapist and a relaxation area. So there is really no reason why you will not leave this hotel stress-free and feeling completely rejuvenated. If you don´t have a chance to stay at the hotel then, why not enjoy MallorcanTonic´s exclusive Spa Day with Lunch. The location. 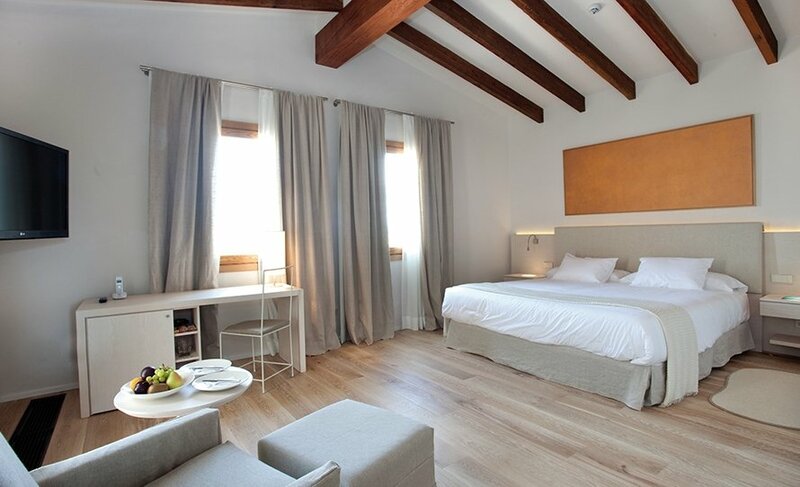 Situated between Campos and Colònia de Sant Jordi, the hotel enjoys a very special position. Overlooking the natural salt flats of Es Salobrar de Campos in use since Romans times to extract sea salt (known then as ‘white gold’) by the age-old method of channelling sea water into salt pans where the sun then evaporates the water leaving the salt behind. Make sure to visit just a few minutes on foot the Flor de Sal visitors centre and shop. It is also a nature reserve and protected area for flowers and wildlife specifically birds. It is said, that some 1700 species of birds have been identified in the area. 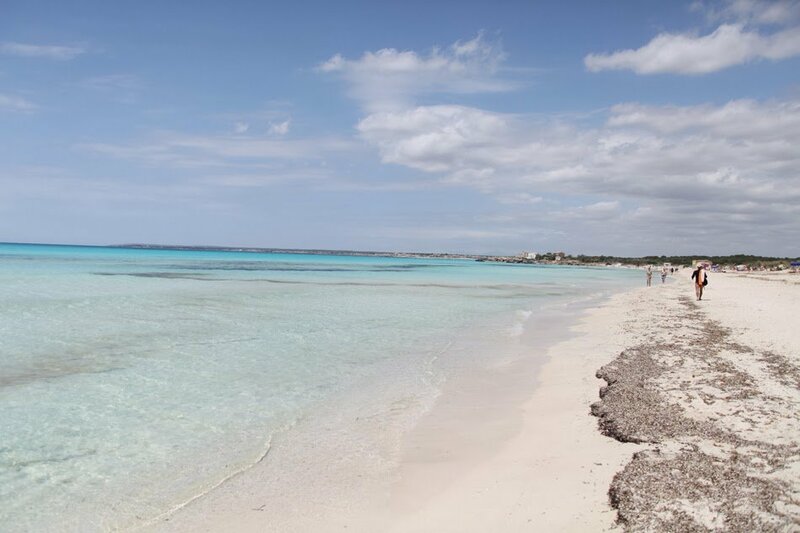 Just minutes from the beaches of Es Trenc, Ses Covetes and Sa Rapita which are three of the most famous beaches in Mallorca due to their long stretches of dazzling sand and crystal clear waters which are absolute stunners for swimming or a brisk walk off-season. The nearby town of Colonia de Sant Jordi is where you can take the short boat ride across to the turquoise waters of the archipelago of Cabrera. Declared a Marineland National Park in 1991, this small island paradise is an absolute must to visit. Breakfast, which is included in the room rate, is a leisurely affair served between 08.00-11.00am in the Restaurant Font Santa. Set in a bright light building apart from the main house, it overlooks the garden. The restaurant spills out onto a spacious terrace when the weather allows. Lunch and dinner are also served here and Chef José Tarin from Valencia and his team present a delicious Mediterranean and international menu with a good selection of local Mallorcan wines to accompany. Images kindly provided by Font Santa Hotel.